The light fixture we attached to the bedroom ceiling fan was always intended as a temporary solution to our overhead lighting problem. Our bedroom does not have high ceilings, so the light fixture dangling down made the ceilings feel even lower. That had to go. We’re glad we added it when we moved in 18 months ago, but we were ready for an upgrade. That said, we want to keep the ceiling fan because we use it almost every night (Kristin gets very hot at nighttime). 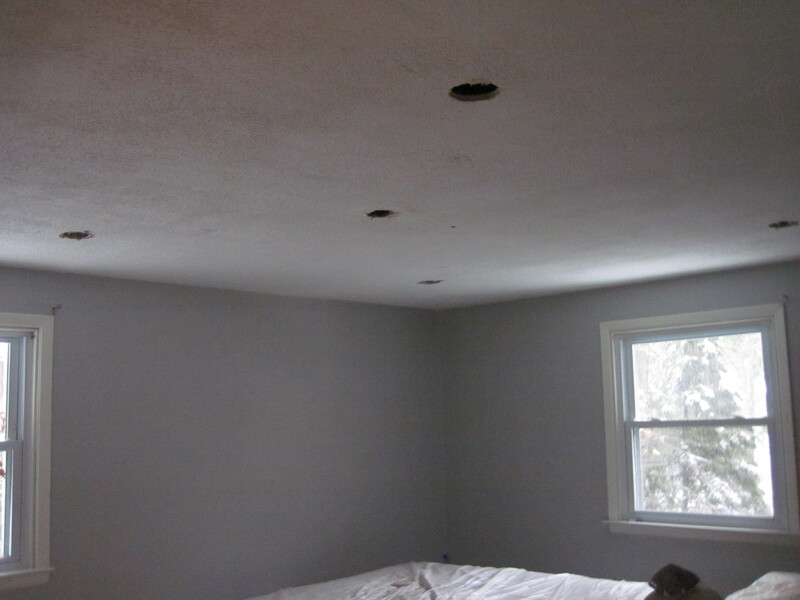 For new lighting, we are going to add four recessed lights. 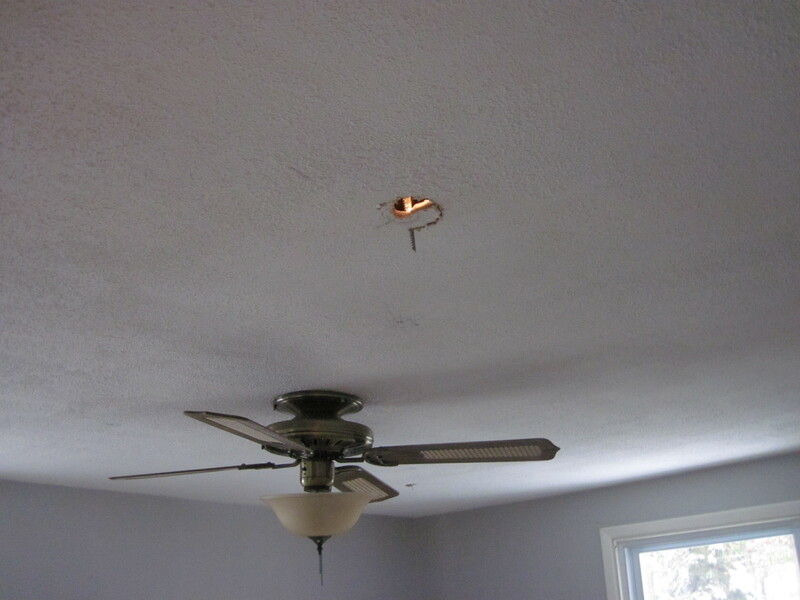 The ceiling fan is being relocated to the true center of the room. The fan was installed before the bathroom and so it is not centered based on where the bedroom wall is now. 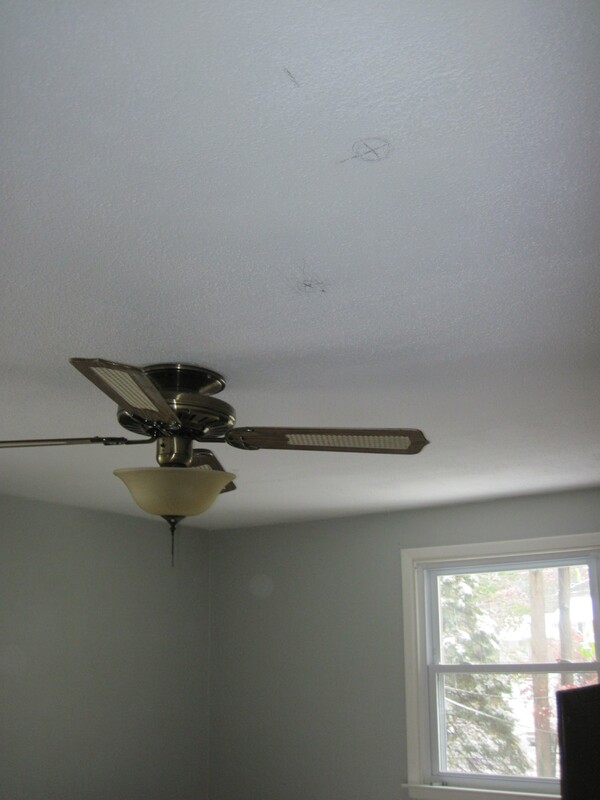 The four recessed lights will be added around the ceiling fan. 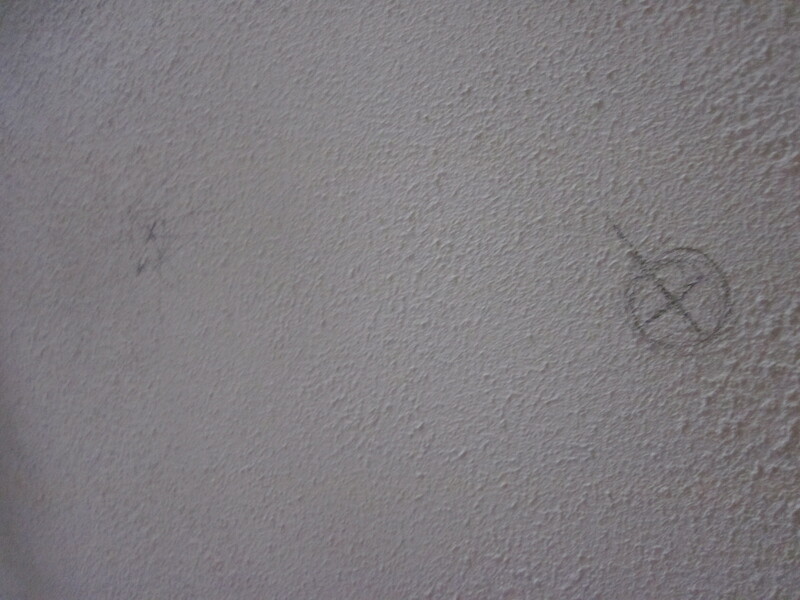 Krister marked up the ceiling per Kristin’s plan. There are two sets of marks because we changed our mind about the location of the lights after we saw the plan. We originally though we’d have them centered in the room, but when we saw how close the lights were to the fan, we realized we had to move them a bit closer to the walls and away from the middle of the room. After we marked where the lights would be installed, Krister drilled a small hole in the middle of the future-light fixture. We hit one stud when we were drilling into the ceiling, which resulted in us relocating two lights (both along the stud) by just a smidge. Then he went into the crawl space to cut out a full-sized hole. You can see we put the rough cuts into the ceiling before drywalling over the texture (as we discussed in our post yesterday). That way, if we messed up, we would just be covering it up anyway. It wasn’t a wasted effort either; now we can see from the crawl space where to cut the holes after we installed the new ceiling. We are also planning to add a very small chandelier/light fixture in the entrance of the bedroom. The chandelier/light fixture needs to be very small (no bigger than 8 inches or so long) but still relatively ornate and decorative since you can see it from the living room. While we’re on the subject of lighting, we will have table lamps next to the bed in addition to the recessed lighting and the future chandelier . We are currently focused on the overhead lighting right now, since the table lamps are more of a decorative element that we will deal with when we update the bedroom furniture.